I've only read one book of Vickie's – The Anonymous Bride, and really enjoyed her style. Books 2 and 3 of the Boardinghouse Brides are on my shelf, but have you ever seen my shelves? My TBR (to-be-read) pile only gets taller and taller by the day (last check...124 books and counting – and that's just on my living room shelves, didn't even bother checking my 'upstairs' books)! Anyway, it's hard to choose when I have breaks between review books! 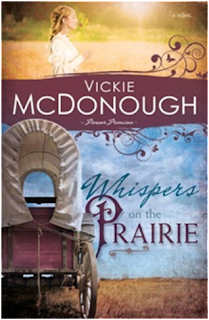 So...I had a chance to review Vickie's newest book, Whispers on the Prairie, and that meant a book of hers went to the top of the TBR pile! Vickie's style was as enjoyable as I remember! I didn't really think Sarah was Miss Priss – never felt much of her 'citified' history to make a good foundation for that argument. She seemed willing to pitch in with wagon train and household chores and was a good cook (something sophisticated girls in historical books can't seem to do). She just seemed like a sweet girl who had many things go wrong in her young life. I loved the tension of the three brothers with one pretty girl in the house. Who will win her heart? And, I loved that Mrs. Harper seemed to know just which son liked Sarah, and encouraged him without being pushy. I did think the ending was a bit hurried – not in the exciting don't-let-her-get-away way, but I didn't expect Sarah to yell to – I won't say which brother! – and declare her love... She didn't seem the type to be so forward, when she didn't think he liked her! Regardless, Whispers on the Prairie was sweet and tender, with some fun and seriousness – just the kind of western-wagon-train-prairie-settlers romance I enjoy! I hope the rest of Vickie's Pioneer Promises series deals with the other 2 Harper brothers! I liked that whole family and want to hear more! “You’ll make a good mother one day.” Mrs. Rayburn leaned against the door frame, looking tired. Thank you to Vickie and Whitaker House through FIRST blog tours for sending me a copy to read and review! Today, CFBA introduces In Golden Splendor by Michael K. Reynolds. Irish immigrant Seamus Hanley is a lost soul, haunted by his past as a U.S. Army deserter and living alone in the wilderness of the Rocky Mountains in 1849. But after witnessing a deadly stage coach crash, he finds purpose in the scattered wreckage -- a letter with a picture of a beautiful and captivating woman named Ashlyn living in San Francisco at the height of the Gold Rush. Moved by her written plea for help, he abandons all and sets out on an epic journey across the wild and picturesque American frontier. While being pursued by those who want to hang him, Seamus encounters fascinating characters including a young Pauite Indian who makes the ultimate sacrifice in helping Seamus to cross the snowy Yosemite Valley. Battered but changed for the better, Seamus reaches San Francisco on Christmas Eve as the city burns in the tragic fire of 1849. But there is little time for rest, as an even greater, more harrowing adventure involving Ashlyn is about to begin. 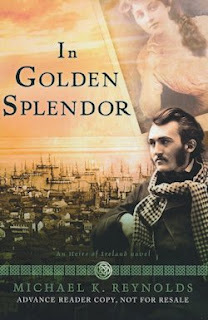 This is Michael Reynold's second book in his Heirs of Ireland series. Book 2 continues the story of Seamus Hanley, who left to serve in the Mexican/American War during book 1, Flight of the Earls. It is helpful to read book one, so you have the proper understanding of a few of the characters...but, In Golden Splendor can certainly stand on its own. Michael crams quite a bit into the book! Everything from horse thievery to St. Patty's Day steamboat races to gold mining...and even pirates – sorta! Although I thought a few spots in the book felt a bit slow and it seemed a few editorial mistakes were overlooked, overall, Michael is a great storyteller! I enjoyed the book and am looking forward to the next book (Songs of the Shenandoah, January 2014) following the determined Irish American Hanley family who will be on opposite sides in the Civil War. His sunken face windburned and forested by an icicle-encrusted mustache and beard, Seamus Hanley exhaled a steamy billow through his cracked lips into the frosty mountain air. Then the Irishman held his breath and lowered his rusted Brown Bess musket, his hands numbed by the frigidness breaching his torn and frayed bearskin gauntlets. The pain of hunger in his stomach had long subsided, and now only the trembling of his grip and weariness of his soul impressed upon him the urgency of this unpleasant task. He closed one of his lake-blue eyes, the last remnant of the promise of his youth, and sighted the muzzle of the weapon at the unsuspecting, rummaging elk. Even at a distance, the ribs of the great beast showed through its patchy and scarred chestnut fur. Through the barrel’s eye, Seamus tracked the young bull as it limped its way over to an aspen tree. The elk raised its head, crowned in mockery by horns uneven and fractured. Did it catch his scent? Then the animal relaxed, bared its teeth, and tugged on a low-lying branch, releasing a powdery mist of fresh snowfall and uncovering autumnal leaves of maroon, amber, and burnt orange. Brilliant watercolor splashes on a white canvas. In the deadly stillness of a finger poised on a trigger, Seamus shared a kinship of loneliness and futility with his prey, whose ear flapped and jaw bulged as it chewed. This wasn’t the way it should be. For both were trailing the herd at this time of season. This was when both mountain men and wildlife should be well fattened by summer’s gracious hands. For the fall offered only last provisions, the final stones in the fortress. Because, like shadows in the distant horizon, the bitter enemies of winter were approaching. The frizzen was closed, the powder set, and his very last musket ball was loaded. This would be his only shot. For it had been another disappointing trade season amidst the dwindling market of beaver, otter, and marmot pelts. The fashion shifts in faraway places like New York and Europe were flushing out trappers like Seamus throughout the Western out- lands of this sprouting nation. But he expected as much. Seamus’s past was rife with disappointing harvests. With a pang of regret, his numb finger squeezed ever so gently and spark and flame breached the touchhole, igniting the gunpowder and sending a lead ball, laced with hope and desperation, through the icy air. Sounds, though dampened by the snow, ricocheted through the woods. The creature leapt into the air, thighs and legs flailing in a moment of frenzy. Then it gathered itself, turned, and bobbed its white tail up through the embankment into the sheltering embrace of the frozen forest. A flash here. A speck of brown again. Then it was gone. And Seamus was alone. Completely alone. Seamus lumbered over to a tree stump mushroomed by snow, and with the back of his glove he gave it a firm sweep to dust it clean before sitting down on the iced, jagged surface. “Arrgh!” He flung his musket in the air, watching it spiral before being enveloped into a bank of snow. Then he lowered his face into his moist, fur-covered hands and sobbed. No one would see him cry. No one ever did. Here, in the high country, emotions were shielded by solitude. Though just two years had passed, it seemed forever ago when he chose self-exile. When he tried to hide from the memories. Seamus could barely recall the laughter of his youth and his passion for whimsy. Growing up in the green-rich fields of Ireland, he would feast off the sparkle of cheer that echoed through the farmlands of his people back home. But that was many tragedies ago. Now that all looked like someone else’s life. He dwelled in the blackness of despair for a while, but even- tually the chilling lashes of the winds pried him from the depths of his misery. Survival still lorded over the emptiness. Seamus retrieved his musket from its snowy grave. It was useless without ammunition, but he couldn’t part with one of his only friends. With slumping shoulders, he headed home. Home. His misshapen cabin in the hollow of the woods. Despite his best efforts to acclimate to the wilderness, he was still merely trespassing. And where was home when your spirit wandered? Yet there was a more pressing question. Would he even make it back to the cabin? The moment the hobbled elk escaped, it became Seamus who was hunted. He had risked the chase and strayed far. Now his hunger grew fangs and eyed its prey. The weariness. The throbbing of his temples. Seamus popped the top of his canteen, lifted it, and poured water down his dry, aching throat. Then he surveyed this unfamiliar terrain. He rarely traversed this patch of backcountry and for good reason. Civilization had encroached following the opening of a United States Army outpost not far away. It intersected with the Oregon Trail, the main pathway for travelers to the West, who of late were drawn in droves to the resonating whispers of gold in California. The army fort was tasked to free the flow of commerce from the growing hindrance of the Indian population. Seamus had no quarrels with the brown-skinned natives of this territory. In fact, he coveted their ability to thrive in this cruel environment, which had buckled him to his knees. Thank you to Michael and B&H Books through CFBA for sending me a copy to read and review!